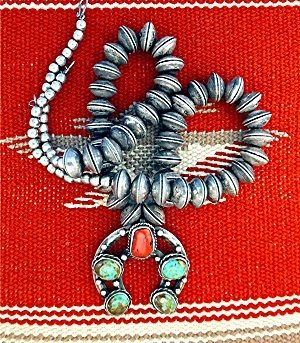 Antique Sterling Silver 1950s-60 Dimes Coin Necklace with Sterling Silver Ox Blood Coral and Cerillos Turquoise Center Naja. 26 inches 2 3/8 inch Naja and 9.3 ozs. There is a Hook Casp and the Marks on the naja are JD Or Co Joined Jt. Necklace would be perfect for a Man or Lady.